I'm not usually one to talk about weight loss as I believe it should be the result of looking after our health, rather than the focus. But the more clients I see, the more I’m seeing this dilemma come up - unexplained weight gain. They feel they’re doing everything right, eating well and exercising yet they either can’t lose the weight they’ve put on or their weight continues to fluctuate. Well thankfully science can explain this so I've listed 3 of the most common hormone contributors below. Hint: Pin this for a later date, so if these symptoms ever creep in you'll know where to go! An under-active thyroid occurs 8-10x more frequently in women and while your TSH (common thyroid test) may come back as normal, if you’ve got some of these symptoms below then it’s time to look deeper and maybe see a natural health care practitioner for functional testing. Cut down on refined wheat products with gluten. Support the healing of your gut through organic bone broths, grass fed gelatine, increasing your intake of vegetables, fermented foods and avoiding refined sugars. Estrogen dominance is becoming a common hormonal imbalance seen in practice today due to many reasons, some being the use of the oral contraceptive pill, stress, the products we use, genetics, our environment and of course our diet. It may be confusing to here that high estrogen causes weight gain, because menopausal women gain weight from reduced amounts. But estrogen dominance actually refers to the ratio of estrogen to progesterone. 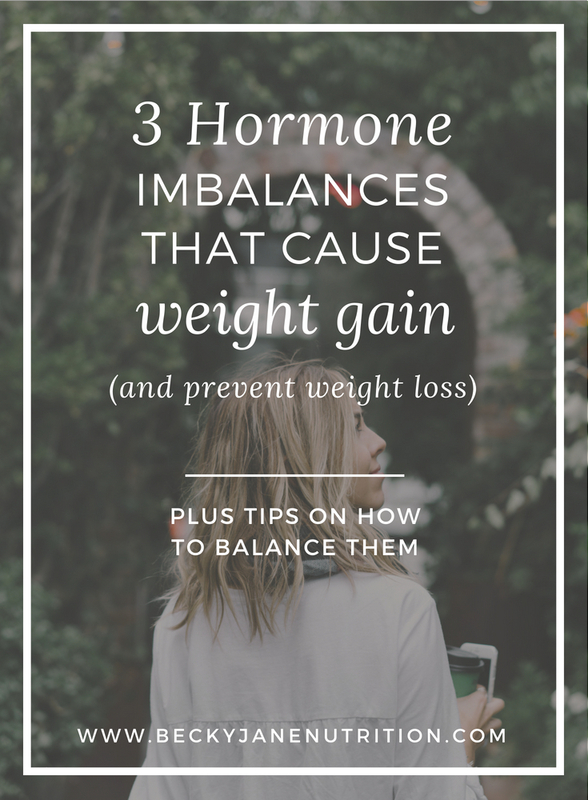 And when our progesterone is low, but our estrogen is normal, we can experience high oestrogen symptoms because these 2 critical hormones aren't balanced. Again, functional testing like a saliva hormone profile is one of the best tests to see exactly what your hormones are doing. It may be about building up progesterone, compared to lowering estrogen in some women. Support your liver as much as you can, such as adding leafy greens and cruciferous vegetables to every meal, starting your day with lemon water, limiting coffee, alcohol and sugar and exercising regularly. Avoid plastic bottles and containers. Opt for stainless steel, ceramic or glass. Choose organic, natural beauty and house hold cleaning products. I elaborated on the reason why this is important over at maaemo organics; you can read more about it here and check out their beautiful products at the same time. Related: Is snacking the cause of your hormone imbalances? Basically insulin allows our cells to use glucose for energy, so without it, that glucose gets converted into fat. If we repeatedly consume high sugar or simple carbohydrate foods (eg. white pasta and bread), our body can become less sensitive to using insulin and we can develop insulin resistance. Women with PCOS (now occurring in 1 in 10 women) tend to have insulin resistance as a major driver, so you don’t just have to have diabetes to be at risk. Cut down the stress in your life. High cortisol levels can lead to insulin resistance, so identify and limit the major stressors where you can. If you’re in a busy season, yoga has been clinically proven to improve the stress response and resilience. Remember you are the best judge of what your body’s telling you. No matter what a blood test says, you have the final say to do something about your symptoms and experience long term, vibrant health.